After my mammoth blogging extravaganza when I posted every day in November, I’ve been having a little rest. It’s rather delightful! Almost inevitably, I’ve done more poetry writing which is a good thing, I think (*peruses notebook nervously*). I’ve also applied for a couple of jobs (and been turned down for one 😦 ) – nothing groundbreaking and certainly not very well paid, but jobs that might provide a basic income while allowing me time to pursue my own creative endeavours. Isn’t this what many of us want? I’ve really loved teaching poetry again which is what I’ve been doing since September and I hope to develop more workshops next year. I love the whole process: planning which poems to read, shaping writing exercise around them, delivering workshops and offering feedback to my students. I would do this kind of work more regularly if I could recruit more participants but I think I will need to be more famous to be able to attract attention and/or I would need to be attached to a venue or organisation which is geared up for marketing my courses. It’s something I can think about. Last night, about seventeen of us gathered at Trowbridge Town Hall for an Open-Mic Night. There were a few new faces as well as many familiar ones and what was really, really wonderful was that people who hadn’t read in front of an audience before, or not for a long time, got up to read. So the small crowd was perfect for the occasion and it was so good to hear everyone’s poems. Most of the readers were people who come to our Poetry Society Stanza group or people who’ve come to my classes or a combination. My one regret was not taking any photos! 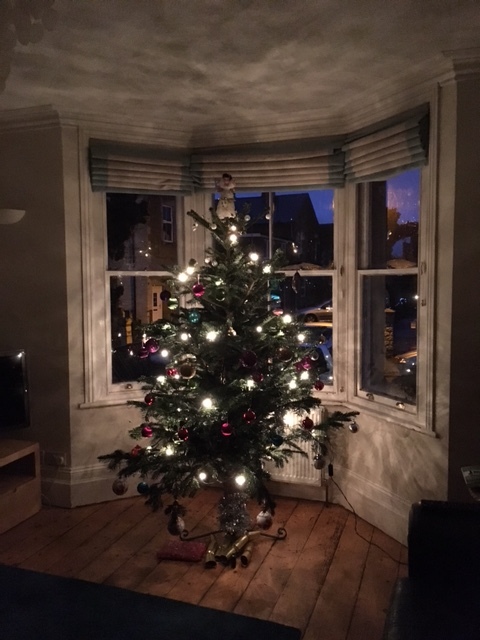 You’ll have to make do with a picture of our Christmas tree, instead. Not many presents under the tree yet! It does feel slightly strange not to be blogging daily but also rather like being on holiday. I hear you on the job-hunting front – I’m also looking for a job that will pay the bills while allowing me enough time to write. Sadly, not that many of them around, and certainly not those which will also allow me to support my children as a single mum. Anyway, here’s to the best of luck with your job hunt and with your courses. I love the sound of them and just wish I was living closer, so I could attend. Perhaps some day (I have a friend who lives near Bath and could host me). P. S. Your tree looks lovely! I’m impressed by your enthusiasm, innovation and ambition in setting up your workshops. No doubt you’ll be able to build on the experience at a later date. Enjoy the holiday. I am loving mine. I may not return till June at this rate.